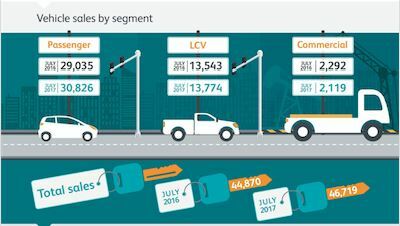 South Africa’s new vehicle sales grew 4.1% in July, with a total of 46 719 units sold, according to the latest aggregated sales data from the National Association of Automobile Manufacturers of South Africa (Naamsa). While industry sales were up marginally in June, with 0.9% growth, the positive performance proves to be good news for this year’s sales figures. Year-to-date, total industry sales are now down only 0.3%. The most notable positive performance was in the passenger car segment, which represents two thirds of total sales volumes. Total passenger car sales grew 6.2%, and passenger car sales through the dealer channel were up 4%, compared to July 2016. Growth of 10.6% was seen in total sales to the rental channel while sales through the government channel skyrocketed 152.5%, year-on-year. Household debt levels have steadily declined over the last 24 months and currently sit at 72%. This figure measures the percentage of income consumers use to service their debt. At the same time, there has been a marginal rise in the amount of disposable incomes households have. Additionally, headline inflation and new vehicle price inflation have declined, following a strong performance by the Rand. Vehicle manufacturers have also taken advantage of the performance of the currency to directly pass value to consumers. This is seen in the number of attractive marketing incentives on offer to buyers in the new vehicle market. “Combined, these factors will be conducive to new vehicle sales and positive consumer sentiment,” said Mahoney. “With this past month’s 25 basis points drop in the interest rate, we anticipate that the economy is now in a cycle of rate cuts. Failing any shock events on the local or global stage, this is great news for the economy and new vehicle market.